Rising drug prices have become a public health crisis, forcing too many Americans into making some tough choices. In a recent Consumer Reports Best Buy Drugs’ poll of 1,037 U.S. adults who currently take a prescription medication, one third said they were hit with higher drug prices at the pharmacy counter in the past year. And while the average increase was $39 extra out-of-pocket, one in 10 reported paying $100 or more over what they’d previously paid. Those higher prices led nearly 40 percent of people to take potentially harmful risks with their medication in order to curb costs, including skipping filling a prescription, skipping a dosage, cutting pills in half without a doctor or pharmacist’s OK, and even taking expired meds. While people facing unexpected high costs were more than twice as likely to avoid seeing their doctor or forego a medical procedure than those who didn’t, the financial setbacks affected more than their health. Perhaps the most troubling cutback: A third (32 percent) of poll respondents paying higher prices said they spent less on groceries. And in the last six months alone, 42 percent of people facing higher drug costs also experienced other financial setbacks, including missing payments on major bills and not being able to afford medical bills, medications or gasoline for their car. Forty percent of poll respondents reported spending less on entertainment and dining out in the past year, and a quarter (24 percent) spent less on family. Others put off paying bills, applied for government assistance, and even postponed retirement to maintain health insurance coverage. Eight out of ten consumers went ahead and paid higher prices for their medications, although, chances are, they could have found ways to pay less. While there’s no clear end in sight for rapidly rising drug prices, there are ways for consumers to get a better deal. One recommendation: If you’re paying more for your meds, ask your doctor or pharmacist if it makes sense for you to switch to a drug that’s cheaper and just as effective and safe. In some cases, that may mean simply switching from a brand-name drug to a less-expensive generic equivalent. 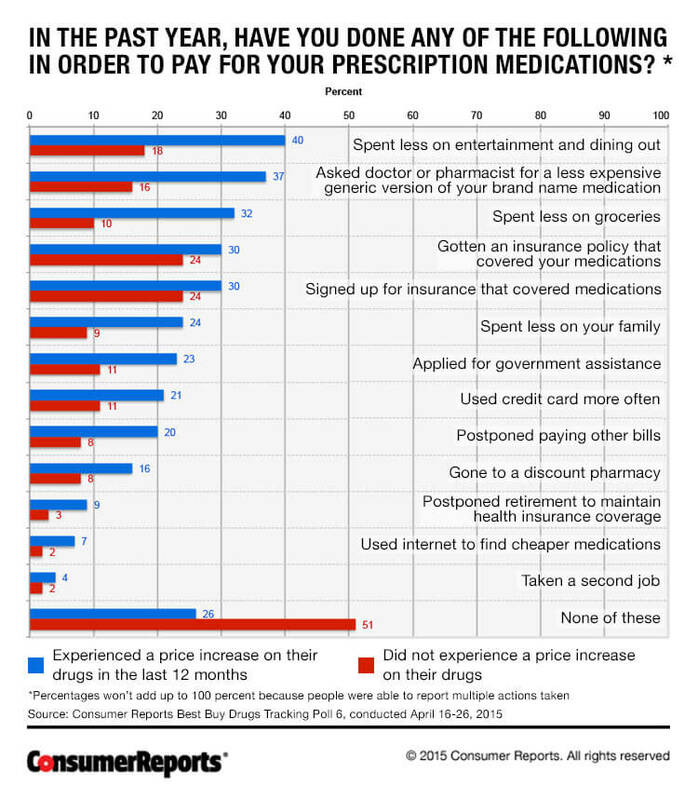 One-quarter of poll respondents said they called their insurance company to see if it would cover a greater percentage of their medication’s costs, or asked their doctor or pharmacist to switch their prescription to a lower-cost drug. 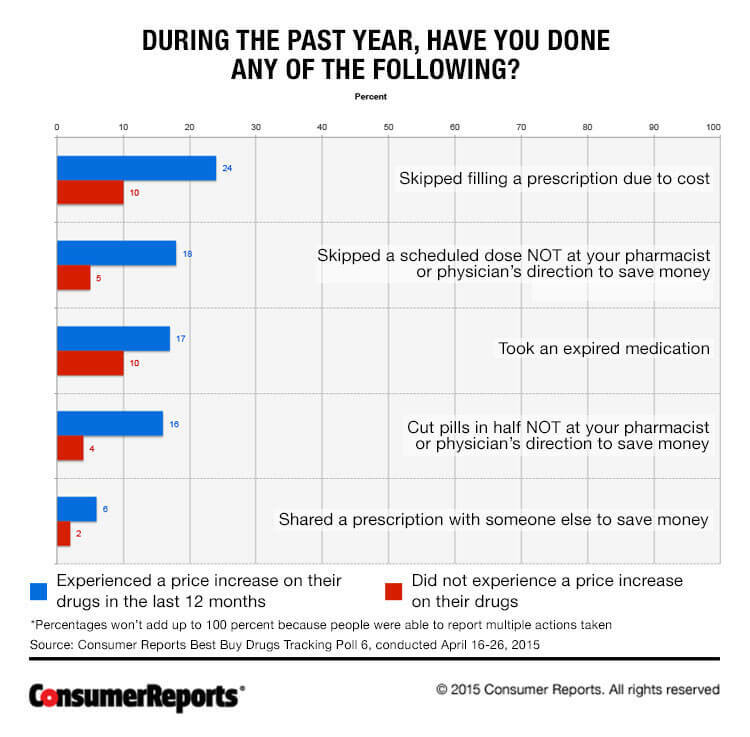 Shopping around at other pharmacies for a lower price is a worth a try, too—17 percent of people said they did that. Consumer Reports Best Buy Drugs’ secret shoppers have found that drug prices can be wildly different from one pharmacy to the next. And don’t forget to check with independent pharmacies—they may be willing to match or beat competitor prices (but you have to ask). For more cost-lowering strategies and the best deals on prescription drugs, check out Consumer Reports’ free guide, Best Drugs for Less (in English and Spanish), and sign up for our webinar on Thursday August 27 at 2pm EST, Best Drugs for Less: 10 Ways to Save on the Medicine You Need. Register here. Ginger Skinner is a writer for Consumer Reports Best Buy Drugs, a public education project dedicated to helping you talk to your doctor about prescription drugs, and helping you find the most effective and safest drugs for the best price. To stay up to date on Best Buy Drugs news and advice, connect with them on Facebook and Twitter, and sign up for the free monthly e-alerts.